This past Saturday I attended NYC's annual Santacon for the very first time - not to mention two years overdue! If you've ever attended a Santacon, you know the competition is real as to which Santa wore it best. BUT, Santa will not settle for showing up with just a Santa hat on. You're either decked all out, or not at all. Every year I hear of tons of people dressed up as reindeer, elves, and even the Grinch. So obviously I had to top the rest. This is the first semester as an alumni of my beautiful sorority, and it's like I was forced to graduate my creative mind from the dressing-up-for-mixers scene. Last year, I rocked my own DIY Christmas tree costume. If you haven't seen my tutorial yet, you can see it here! Not only was this the first time I wasn't asked "what are you even dressed as? ", but probably the cheapest costume I ever put together in such short notice. I present to you... my 2014 Santacon ensemble. Decorating the top was seriously so simple - so simple that I actually decorated it on the bus, on my way to the city, while the top was already on me. That's right! For starters, I traced 3 circles from a cup onto the green felt sheet, and cut them out. 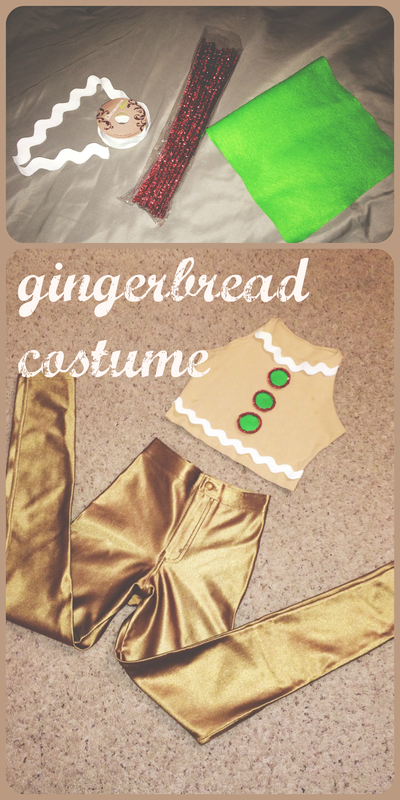 I googled gingerbread costumes and found that green felt versus red felt (as the buttons) were the most obvious for people to decipher what I am, but I knew red for the holiday season was definitely missing in the mix! That's when I decided to hot glue red pipe cleaner on top of the circles as close to the edges as possible. I measured how much white fabric trim could fit around the bottom of my crop top when tied in a knot, then cut it off the roll. I did the same for the lining around the top, but didn't want this portion to be tied around my neck so I cut it short. Since I did not want to ruin one of my favorite crop tops, I used double-sided fashion tape to stick the green buttons and fabric trim on. Fashion tape has saved so many articles of clothing (and lives) in so many situations, and if you don't have your own roll I encourage you to go get some. Like now. They can be found at Harmon Discount or on Amazon here! Call me crazy for already having the top and pants in my closet, but you can't beat a fabulous DIY costume for $6 (all from Hobby Lobby).